During your visit to the Museum of Aviation, don’t miss your chance to ride our new Virtual Reality Simulator, located in the main Eagle building! 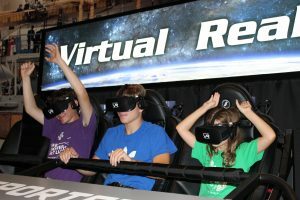 The ride features three adventures including an eye-popping, first-person adventure entitled Spacewalk VR: Danger in Orbit, letting patrons assume the role of an astronaut testing a new manned-maneuvering unit as they explore the elaborate the exterior of the International Space Station high above Earth. Individuals will also have the option to be “transported” back in time and glimpse amazing marine life of the distant past through a second adventure entitled Prehistoric Dive VR. Lastly, visitors will be able to ride our newest adventure called Cosmic Coaster, which takes riders on a roller coaster ride through outer space. The VR Transporter accommodates up to four people per ride cycle. The motion platform elevates, pitches, and rolls in computer-controlled increments designed to mimic the path of the would-be astronauts as they float in space on their extravehicular (EVA) journey from the cargo bay of the Space Shuttle Discovery to the International Space Station. It also allows people to go underwater to explore a mysterious prehistoric ocean, meeting creatures such as a massive Archelon sea turtle, a graceful long-necked Styxosaurus, a powerful Ginsu Shark and coming face-to-face with monstrous Megalodons! Tickets for the VR Transporter ride may be purchased at the VR Transporter in the rotunda on the first floor of the Eagle Building, or in the Museum Gift Shop. The VR Transporter is open during all operating hours of the Museum. 9:00 a.m. – 5:00 p.m. Monday through Sunday. Ticket prices are $10 per ride or $8 for military and first responders.